Welcome to Weekend Watch, a recurring feature where we highlight some of the best geek-related videos around the web. Whether it’s short films, behind-the-scenes clips, video essays, or top 10 countdowns, the only requirement is that they are about our favorite geeky topics! 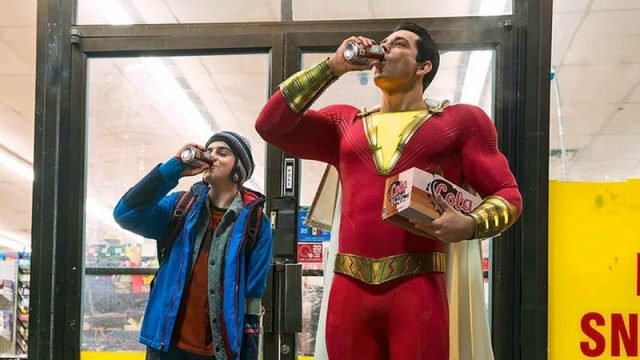 In this week’s edition of Weekend Watch, we’re celebrating the release of Shazam! with a flurry of (spoiler-free) informative and fun video content. Starting off with the former half of that spectrum, we have a featurette that offers the basic info on Shazam! before diving into the deep end. Next, we have a series of videos that cover of Shazam’s complicated comic book history, the origin of the character and his powers, along with a look into the history of the films villain, Doctor Sivanna. Switching to a lighter tone, we have a duo of videos where the three leads of the film interview each other, along with the trio reacting to Internet comments about the movie. Finally, we round things out with a top ten video, as well as heralding the long-awaited return of Comic Book Shopping. In this quick featurette courtesy of Warner Brothers, we start off with a look at the film itself. This video does a great job of selling the fun tone of Shazam!. Aside from showcasing some of the film’s great moments in the trailer, it also gives some insight into how this is different kind of superhero movie. This video from the always trusty Variant explores the origin of Shazam, the ancient wizard who gives Billy his powers. It also recaps how Billy eventually became the world’s mightiest mortal. This video also does a great job of recapping the New 52 version origin of Shazam. Key Issues breaks down Shazam’s powers for those who are uninitiated. Despite the required origin recap, this video does a good job of explaining the six-distinct sources for which the character gains his powers. Additionally, it explains how all of the character’s powers play out in the film. Up next, we have another video from Variant that breaks down the history of Dorctor Sivanna. This video recaps the various iterations of the character, from his golden age origins all the way to the New 52. Aside from going into the requisite story arcs , the video also hints at the illustrious Mr. Mind. Lightening things up a bit, the first of two videos from IGN sees the cast of Shazam! interviewing each other. Even though this video in particular is pretty light in terms of compelling content, it’s indicative of the chemistry between these three actors. In the next video, the cast of Shazam! delves into the depths of the IGN comment section. While some of the comments are backhanded as expected, there are some surprisingly nice opinions folded into the mix. There’s clearly nothing Earth shattering here, but it’s still fun to watch. Up next, we have a video from Top 10 Nerd that explores some “shocking” facts that you may or may not be aware of. Admittedly, some of the information here is fairly common knowledge. However, there are enough interesting tidbits here that elaborate on his complex history. Closing things out, we have a brand-new episode of Comic Book Shopping from Collider. In the latest episode of the recently revived series that originated from the late, great Jon Schnepp (R.I.P. ), new host Coy Jandreau meets up with Shazam! star Zachary Levi to share their love of comics. In the video we learn how Levi first got into comics, his thoughts on embodying the character on the big screen, along with showcasing some of their favorite comic book recommendations available now. On a personal note, it’s great to see Collider honoring the legacy of Schnepp by continuing this series. What are your thoughts on this week’s videos? Make sure to let us know in the comment section below!